Manage your healthiness with incentives under integration of blockchain Our mission is to provide a platform with more diversified data collected for users to understand the health status by themselves in order to gain some incentives by improving health status or awareness of own healthiness. A widespread ideology of proactive awareness of own health status is our goal of this project. The objective of mHealthCoin is to connect the fast-growing cannabis industry with the crypto world and to make the benefits of blockchain technology accessible. It should make payments with cryptocurrencies on a world-wide basis suitable for everyday use. We believe that everyone in the world has to be aware of healthiness himself or herself, no matter how old we are, how fat we are, or even how tall we are. However, in reality, most of the people would be likely aware their health situation until they get sick, serious illness, abnormal state or other forms in terms of “illness” instead of trying to prevent in earlier stage. Our mission is to provide a platform with more diversified data collected for users to understand the health status by themselves in order to gain some incentives by improving health status or awareness of own healthiness. A widespread ideology of proactive awareness of own health status is our goal of this project. The all-round mHealthCoin platform is a blockchain based health data keeping and analysis platform. When members do exercises and follow healthy habit, the health data will be captured by our mobile app and smartwearable and encrypted and submitted to blockchain. Each user will have his own chain for keeping health and account information, new coins will be generated as health information grows. The blockchain will be based on Nxt blockchain, using Proof of Stake (PoS) consensus. Our app is also an all-in-one platform for peers to manage their data and wallet. Our smartwearable supports 24 hours monitoring and different special features for different needs. Cloud health token exchange will be a marketplace for you to use your coins on whatever your heart desires. Small and Big data analysis and AI will be used to bring users discounts, services and goods that are most relevant to their health and fitness goals. 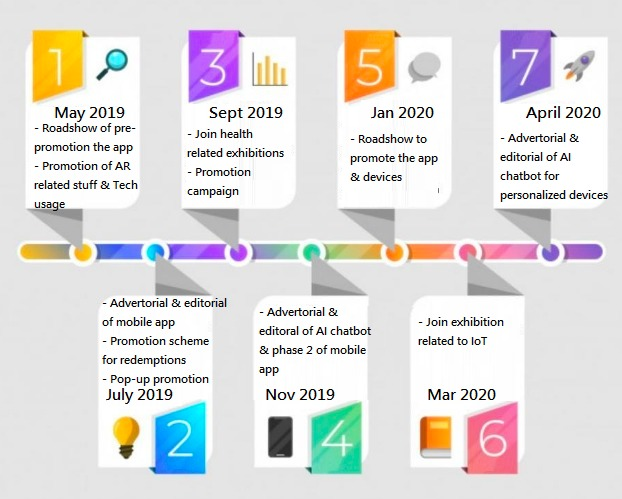 A chatbot, bob the chatbot, will be built to offer personalized advice to further encourage members to follow the healthy habits and achieve their health and fitness goals. Hence a positive feedback loop is formed. Sharing your workout achievements with friends couldn’t be easier. Exercise Sharing allows you to tell your friends and followers about your workout on any social network. Wearable device allows you to enjoy the workout and share with other.